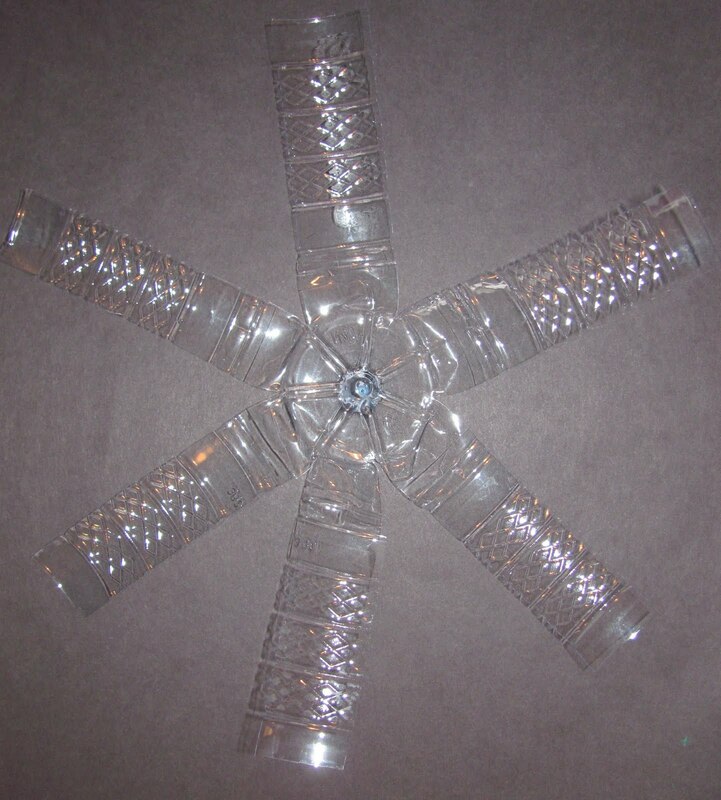 This is the second part of my Recycled Bottle Flower Sun Catcher post. This time instead of using permanent markers to design the flowers we used colorful tissue paper. I like both ideas! The tissue paper is nice because it is so much more vibrant. This project has the same beginning steps of my previous post: Cut the bottle in half. Then cut slits on the cut ends and flare out to create petals. I like using both parts of the bottle. So keep both to use for variation. You could cut thinner petals, but the tissue would be difficult to apply. 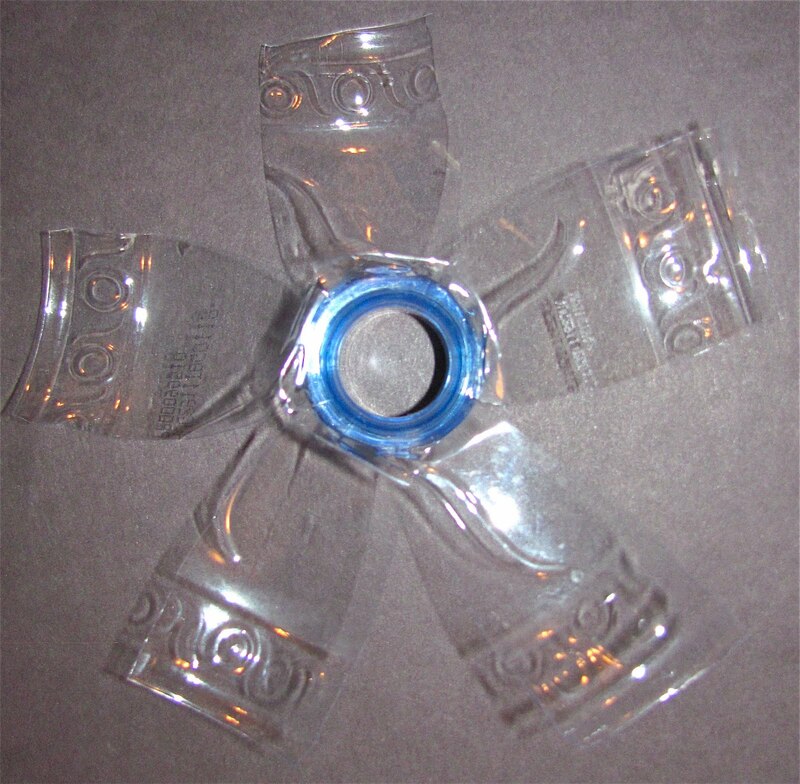 After you cut the bottle, cut some tissue paper squares to fit the bottle. My daughter was being really particular about the pieces fitting perfectly and wanting me to cut them smaller and I told her I could trim the edges after she was done. You'll need a mixture of 2 parts water to 1 part glue to apply the tissue paper. A paint brush worked really well to glue the pieces down. Cassie enjoyed choosing the colors and applying the glue and water mixture with a paint brush. 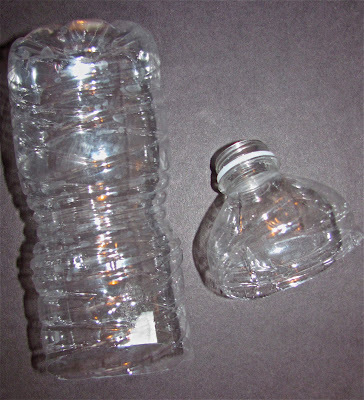 First we would apply glue on the bottle, lay down the tissue paper, and then brush over it. Fill the whole flower and let it dry. It doesn't take that long at all! This last flower is made with a large clear plastic container. I really Love how this turned out! I would like to experiment with more clear types of containers for this project! I tried a more durable container and nearly cut my finger off...ouch! SO.... Please.. Be Careful! 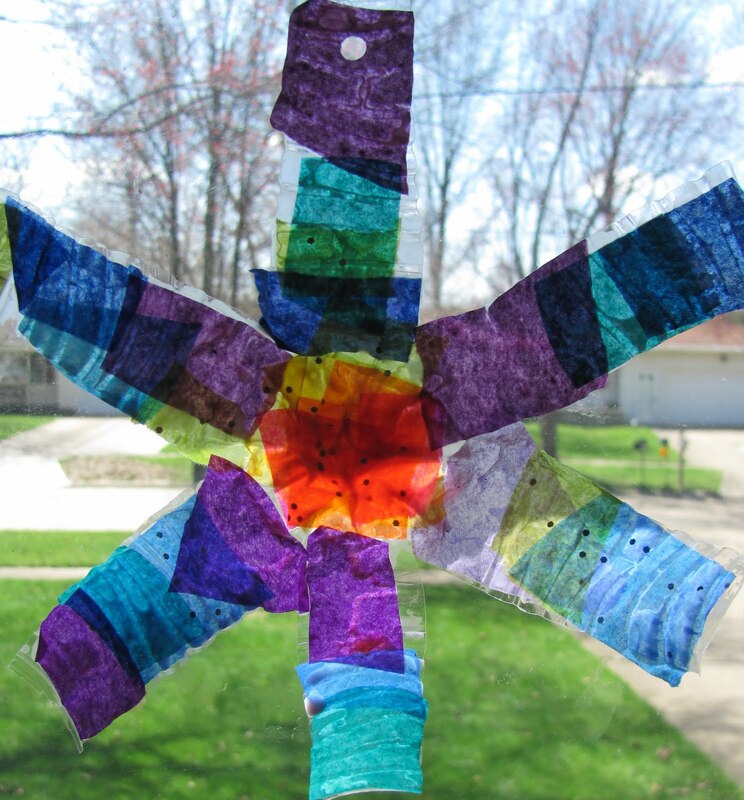 What other clear plastic containers could you experiment with to create recycled flower sun catchers? ***It sure would be nice to be in Babbles top 50! Click here to give me vote! I love the idea of tissue paper. My pre-k class just made flowers using recycled bottles and clear plastic cups (Solo brand). We painted the insides with acrylic craft paint before we cut them. Beautiful! I like the look of tissue paper. These are very nice, and provides a different experience in the process of matching up the tissue shapes, and the glueing. My children love anything having to do with glue. I've been thinking of making these soon, and because my children are quite young (2 to 3), I wasn't sure I wanted to use permanent markers. I'd also thought of painting with glitter glue, there are some kinds with quite pretty shapes as well in the glue. I'll try bothe methods and let you know how it worked. Son unas flores preciosas!!! felicidades!!! Once again, these are beautiful! Though, the marker ones are calling my name :) I can't wait to see what other ideas you come up with suncatchers! They're all awesome so far. You and Cassie are SO BUSY!! 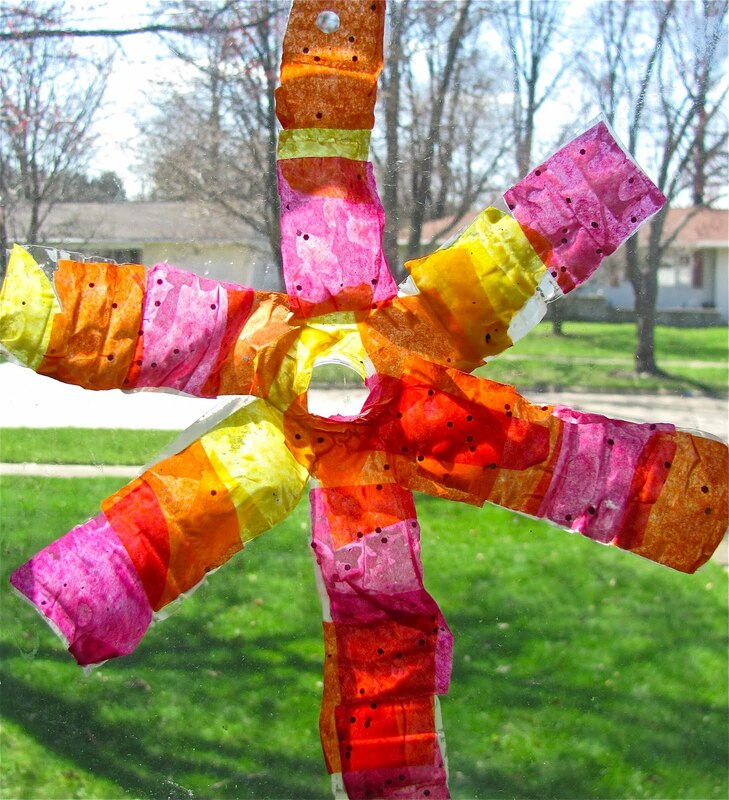 And clearly having a lot of fun :) I like both styles, and the beauty of it is that all of this plastic bottle flower making is giving you new ideas to work out yet ANOTHER project. Can't wait to see what you do next. This looks incredibly beautiful! Thank you for sharing this idea - we might do it for May sun catchers. What a beautiful project. Thanks for sharing! So glad to have found you! I am currently storing up project ideas to try with my rapidly growing 15 month old. I think these ideas are also readily adaptable to use with older students in my art classroom. I will definitely be adding you to my blog roll! wow. this is a great craft. I love it. so simple and sweet. it might be easier to glue the paper on the bottle before cutting it out! These are beautiful, thanks!